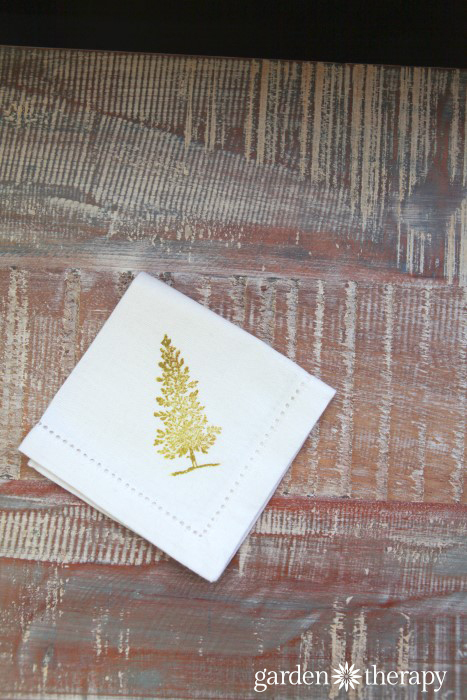 I hand stamped these cocktail napkins with an evergreen tree as they were intended as Christmas gifts. I found a great set of beautiful white 100% cotton cocktail napkins with a nice detail around the edge. They were simple and neutral but needed just a little something extra. The evergreen stamp is part of a stamp set that I borrowed, and this tree was just the right size. They turned out so pretty—simple but elegant—and I thought they would be just the right thing to serve alongside tapas and cocktails. 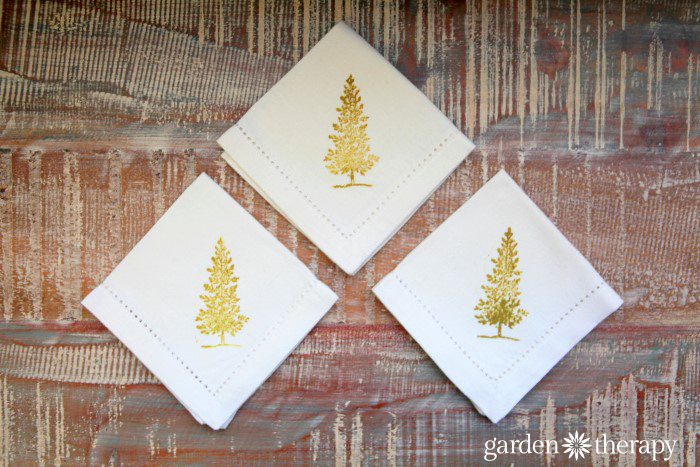 These hand-stamped fabric napkins are great for a dinner party, but they are so easy and inexpensive that you could use them every day. I personally like to use cloth napkins at every meal. Even with a messy kids at the table. Well, especially with messy kits at the table. I need a new napkin each time we sit down at the table and they get used. Hard. Which is actually a really good thing. The more you wash good quality fabric napkins, the softer they get. They even seem to become more absorbent. I’m not sure what the science is behind that last one but I’m always reaching for my older napkins first, for every day use. As I said, I intended to give them away to friends and family, but I brought them to a craft fair over the weekend and they sold out almost right away. I suppose I’m not the only one who thought they would be a great gift! I’m glad that I took a few photos of the process first so I can share the DIY instructions. 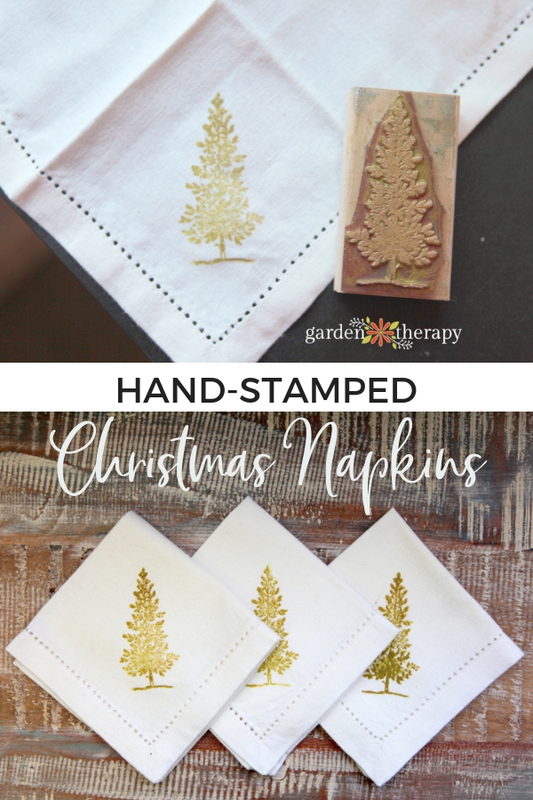 Start by washing, drying, and ironing the napkins to ensure that any chemical finishes that are added to the fabric are removed before stamping. Chemicals are often used in finishing to give fabric a wrinkle-free look and to prevent mildew. Pour a small amount of paint on the plastic lid or paint palette. 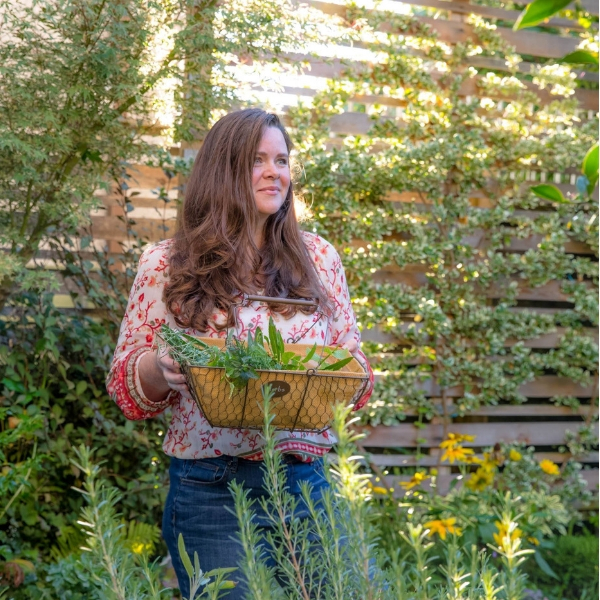 For this project I used a shimmery green-gold that feels very festive, but there are many color options. The key is to use paint made for fabric, not a regular craft paint. This will ensure that the print is permanent once it is heat-set. NOTE: If you are using a light-colored fabric, then choose either dark-colored transparent or opaque paints. A light-colored transparent paint will not show up well on a light fabric, but opaque will cover any color. If you are using dark-colored fabric, then it is best to choose opaque paints because even the light-colored transparent will not show up well. Use the roller paint brush to absorb the paint, then roll it onto the stamp. Test the stamp on a scrap piece of fabric until you get the feel for how much paint to use to get a clean but complete stamped design. 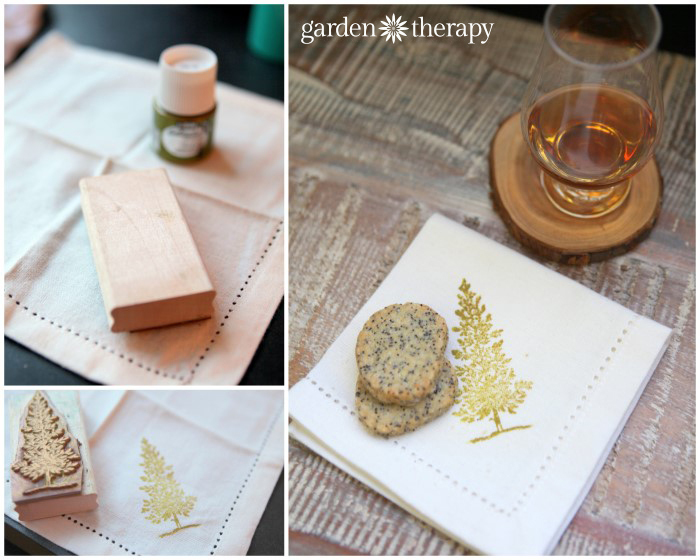 When you have the confidence to stamp the real thing, unfold your napkin and stamp away! Set aside to dry and finish stamping the rest of the set. Once they are dry, the fabric paint needs to be heat-set with an iron to ensure that it won’t wash away. Set the iron to the highest setting allowable for the fabric and turn off the steam. Iron the backside of the stamped area for 3-4 minutes. Use a press cloth to protect your ironing board. I know, I know, ironing each one for 3-4 minutes seems like torture! So set up in front of the TV and put on a good movie. It will be worth it in the end (promise!) 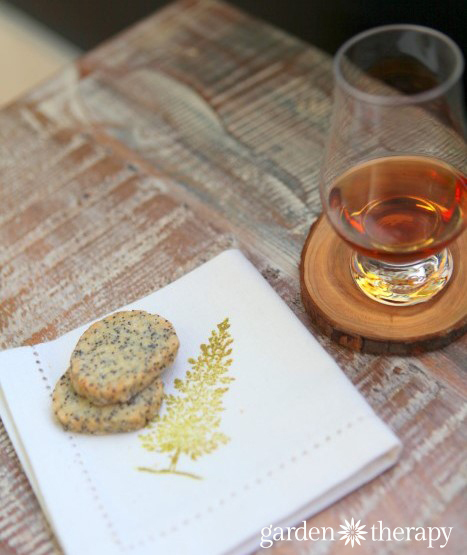 as your personalized napkins will last through many a meal. These are so lovely. Do you know if the paint wash off? 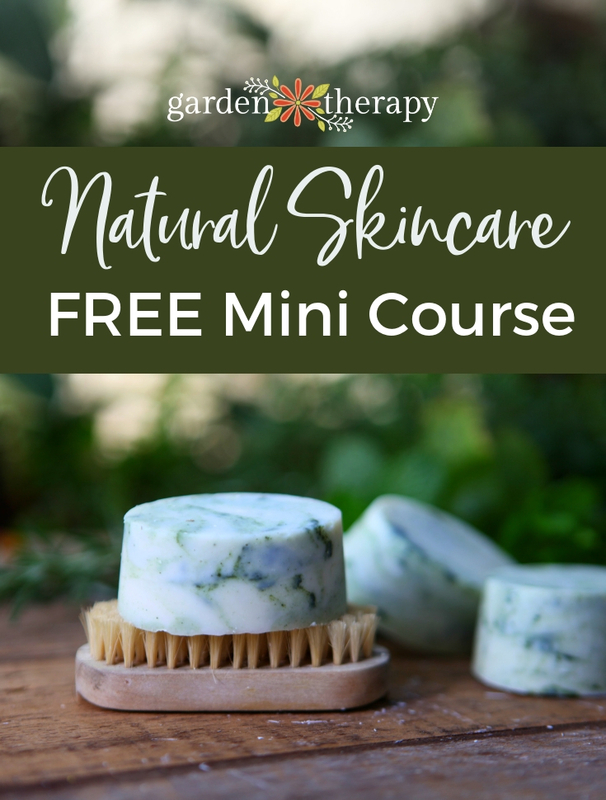 What a sweet idea, these turned out gorgeous! I need to visit a stamp collection. My head just went in a million different directions! So nice of you to share your experience. These are very nice. Where do you get the stamp from? Thanks.